The Gilbert Clinic is an acupuncture practice whose principles are Han Chinese in nature and in practice. In The Gilbert Clinic Blog, we will look at why the medicine of the Han physicians has become critically important in modern America. We will be telling a story of time and wealth, of power and bad haircuts. And, if we listen closely, we will hear the voices of these Han sages still beseeching us from the distant past. In the 6th Century BCE, the situation in China could only be described as a mess. Known as the Warring States Period, it was marked by a protracted civil war between rival families and fiefdoms, all vying for control of the country. The lands were constantly ravaged, people were in a state of flux, and timeshares collapsed. But all this was about to change. Well….it actually took about 400 years…..but it calmed down. What happened? The clan Han had won the day, unified China under a single banner, and the Han Dynasty began in earnest. By the time of the 1st Century BCE, Chinese culture had attained heights unheralded in its (and arguably in all the world’s) history. For the next 300 years, advances in art, culture, industry and commerce created a golden age of Chinese society. There were street lights and plumbing in the capital. The ships that sailed from the empire had compasses fitted into them, and there was social security, a postal service, pensions, and baseball on Wednesdays. The Han dynastic period also produced the three great classics of Chinese medicine. These noteworthy texts are the Yellow Emperor’s Classic of Internal Medicine , The Classic of Difficulties and The Treatise of Febrile Diseases Caused by Interior Cold with Secrets Form the Golden Chamber . 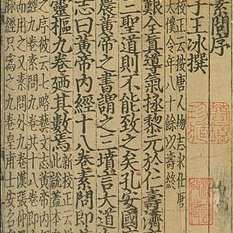 Within these texts are the foundation and principles of Chinese Medicine, the core of which remain as relevant today as at the time of their writing. Certified in both acupuncture and Chinese herbology, Jonathan Gilbert is a recognized expert in the field of Traditional Chinese Medicine. He completed extensive post graduate training as well as a traditional apprenticeship. Read more of Mr. Gilbert’s credentials and written works. Blog text is Copyright ©The Gilbert Clinic, Inc., 2014. Excerpts and links are allowed with credit and direction to original content. For full text reprint permission or a medical consultation with Jonathan Gilbert, contact us at (301) 215-4177 or info@thegilbertclinic.com. In the second century BCE, the Chinese united under a single clan known as the Han. The Han Dynasty produced incredible advances in the sciences, technology, the everyday life of China, and in none more so than in the field of medicine.